Build Quality (7/10): The construction of the HTF600 is rugged in its simplicity – aside from the headband adjustment and a small amount of play in the earcups, there are no moving parts. This allows the build to be almost entirely plastic, including the inner headband, which makes the Panasonics extremely lightweight and not completely unsuitable for portable use despite their size. The outside surfaces of the earcups feature brushed metal inserts, which help the headphones feel a little less cheap, and the Quick Fit mechanism adds two pre-sets to the adjustable headband. The cable is single-sided, well-relieved, and nearly 10 feet long. Sound (7.75/10): The sound of the Panasonic RP-HTF600-S is rather well-balanced aside from the boosted low end. The bass is strong – depth is decent and impact is plentiful without becoming overwhelming. The Panasonics are much bassier than the Sennheiser HD428 and Beyerdynamic DT235 but don’t quite have the depth and fullness of a Cortex CHP-2500 (Prodipe Pro 800). Notes have good weight and thickness and the boost in the bass results in a pleasantly warm tone. The midrange of the HTF600, while not quite as forward as the low end, still sounds prominent enough to impress with its smooth, musical nature. There is mild bass bleed and the mids are somewhat colored but provide good detail – better, for example, than with the bassier, darker-sounding Monoprice 8323. Clarity is decent but falls well short of higher-end sets – the V-Moda M-80, for example. It doesn’t hurt that the Panasonics have airy, well-balanced treble but the natural clarity is only on par with theSennheiser HD428, which is still less warm and generally more transparent than the Panasonics. Treble is present but not too high on sparkle. It seems smooth on the whole but lacks refinement and – surprisingly – can sound a touch grainy at times. There is a bit of harshness compared to the Cortex CHP-2500, making the HTF600 more fatiguing over very long listening sessions than both the CHP-2500 and the treble-recessed Monoprice 8323. It also sounds a little less clean than the HD428. On the upside, the HTF600 does have better top end extension than the similarly-priced competition and sounds plenty airy as a result. The presentation is generally good – there is plenty of width to the soundstage as well as good depth and height, providing a well-rounded image. Unlike the many other entry-level headphones, the HTF600 never sounds small or closed-in and has plenty of air without sacrificing its impactful low end. Layering is vastly superior to the Monoprice 8323 and makes the Sennheiser HD428 sound flat and distant. Dynamics are good as well and the HTF600 sounds great with everything from classic rock to modern, dynamically-compressed music. Value (9.5/10): Whether at the street price or at full retail, the Panasonic RP-HTF600 is an excellent value. The sound quality is superior to anything I’ve heard in the price range, with plentiful bass impact taking almost nothing away from the clean, detailed sound and spacious presentation. Technically a full-size headphone, it is still sleek, lightweight, and restrained-looking enough to be used outside, appearing no more out of place than a Sony MDR-ZX700 or Superlux HD668B. Isolation is rather low and the headphones do leak sound but those looking for a comfortable, circumauralheadphone will find that what the RP-HTF600 offers may just be the most enjoyable listening experience out there for the money. I can get the first CAL! or this for around the same price. Which one would be the better choice? I listen to a lot of alternative rock and electronic if that helps. I’d go for the CAL! personally, just more of a personal favorite and long-time crowd-pleaser, but they both sound great. Does anyone else not see this review? I’d like to read it, but to my system nothing is visible! 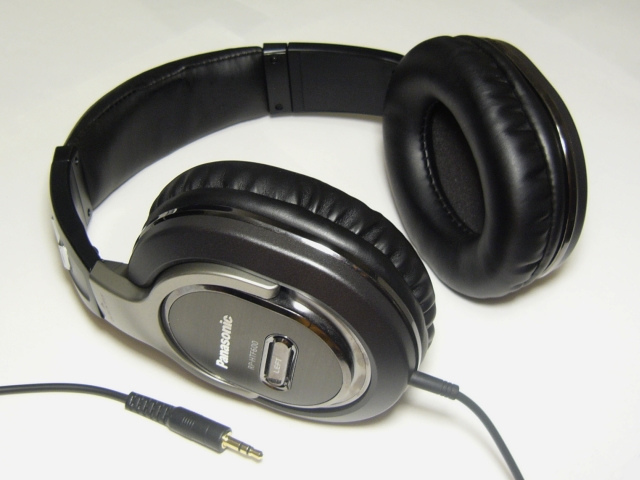 Regardless, How does this headphone compare with the JVC HA-RX700? Not sure what the RX700 sounds like or how it compares to these. Review should be visible – I reset the cache just in case. Do you recommend this headphone over the Sennheiser HD429 in terms of sound quality? The HD429 is a little flatter and more accurate overall, with tighter but less powerful bass. However, I would probably pick these over the Sennheisers given the choice because I actually like the warmer tone and extra bass they offer.